There is nothing like a clean studio to nurture inspiration. I have spent this whole day just gazing around in my studio, admiring how neat and clean it is, wanting so much to start a new painting project. 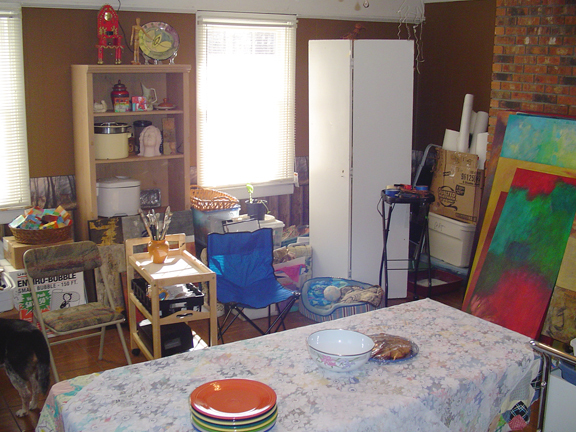 It’s wonderful to have everything out of the way and plenty of room to move. It all started last week when I invited several of my hometown friends to come out and see my studio today and have lunch. Once those plans were in motion, I decided that now would be a perfect time to finally unpack all my largest paintings and get them into the studio, making it into a gallery of my best work. In the process I would have to organize everything else in the space. Yesterday I spent half the day outside, in and out of our storage shed, unpacking all my big paintings and moving them into the studio in the house. It was so cold that I had to wear two pairs of gloves to keep my fingers from being too stiff to work. But I was motivated and determined, and that kept me going. As I opened some of the boxes with the biggest paintings, I was shocked at how differently I see them now after all that time. They had been in boxes since the middle of July. It reinforced my belief that some artworks need some time and distance to be appreciated fully. Two of them in particular were ones I had been ambivalent about since their creation, but now I love them. It’s nice having those paintings where I can look at them. Several are on the wall and several are stacked against the brick fireplace wall. My friends were able to look through all of them with no problem. 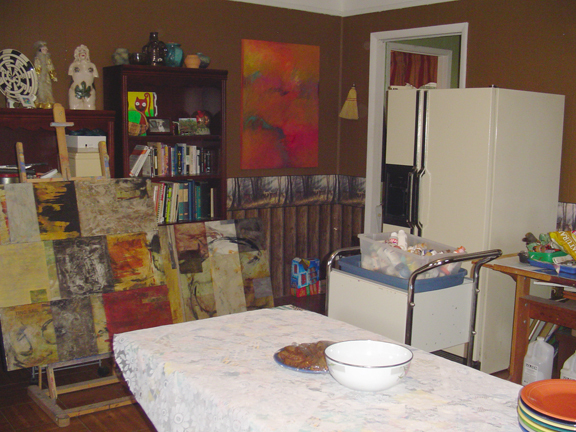 The food table seen in these pictures is my art table covered with a quilt top and lace tablecloth. And look — it even has a refrigerator! We just bought a like-new used one for the kitchen, so now the studio has its own. This means I can now easily entertain seven or so guests in my studio, which also means I could easily teach a workshop or ongoing classes — something I’ve been considering. Nice spacious space, and I love the fridge! Thanks for being here, Beatrice! Glad you like the space and the fridge. AMEN! LOVE clean studios and the possibility they represent! I wish I had one right now…. How awesome it is that time has given you a new perspective on your art! WooHoo! Candy, it’s amazing that at my age and stage in life I still have to have a deadline to really get anything done. For example, all I need in order to get my house clean is to plan a dinner party! Now that the studio is looking more spacious and professional, I feel more like a real artist. And feeling like a real artist is good for creativity. Your studio looks great! and the refrigerator- as you said it allows for all kinds of possibilities. 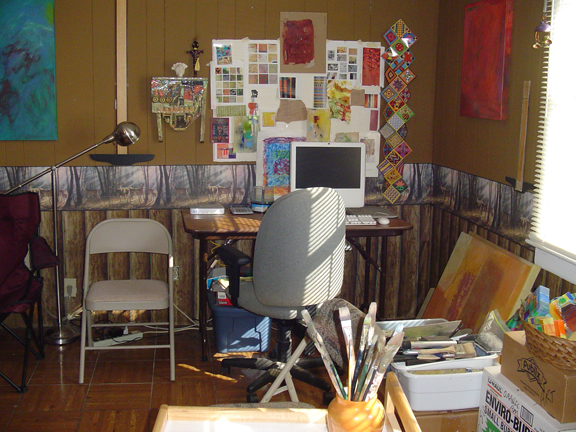 I straightened up my studio yesterday too, it is good for the soul having a neat, clean space. Thank you for showing us. Jane, there must be something in the air! A lot of artists are clearing their spaces. I’ve seen several posts on blogs and Twitter about this. The weather in most areas is conducive to just doing a little prep work before spring gets into full gear. I love seeing your studio. I love the art on the walls too!! Connie, so true! I didn’t realize just how much it clears the cobwebs. And the fridge — it was nice for this little gathering we had. I didn’t have to go all the way to the kitchen to get ice for their drinks. Very nice space to showcase your artwork! I hope you had a great turnout and hopefully sold some of your art. Isn’t it amazing how differently we see our art given time and distance? 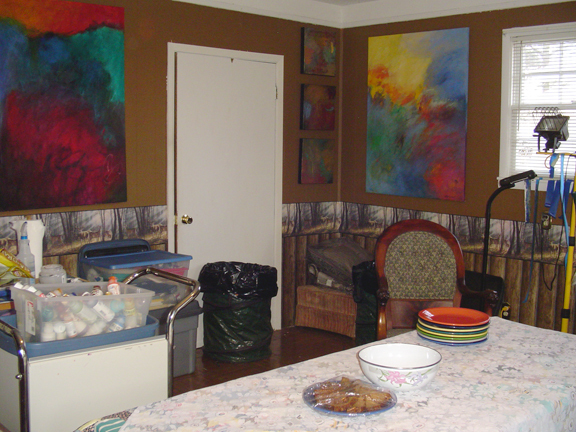 I have been bringing out several of my paintings with the intent to display them around my home this past week. I felt it was time for me to enjoy them and bring them out of hiding. It was amazing how different they looked to me when I went to place them on the walls! My son and daughter-in-law helped with the placement of several of them and even had some wonderful suggestions about turning some of the paintings a different angle. I couldn’t believe I hadn’t thought to try different angles from when I painted them! It’s wonderful getting feedback from others as I’m usually too close to my artwork to be objective. Thanks, Itaya! Didn’t sell any art, but hopefully just raising a little bit of awareness of my presence here. It’s truly amazing to see works that have been put out of sight for a while. My next blog post is more in depth about this subject. I think it’s a wonderful thing to put things away for a while and take a fresh look at them another time. And yes, we are too close to our own work to be objective about it.